I confess I was a bit skeptical when Bill Barrow offered me a review copy of William E. Beyer's The History of the Veterans Memorial Bridge: 90th Anniversary Edition. 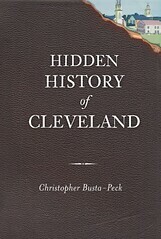 "How can there possibly be 600 pages worth of material on the Detroit-Superior Bridge that anyone would be interested in reading," I asked myself. Further, I thought, "how the heck will I slog through it?" I quickly learned that my fears were unfounded. The 600+ page, 3.5 pound tome is mostly pictures - "profusely illustrated" is the polite term, I think. William E. Beyer became interested in the history of the bridge while working as project manager for Howard, Needles, Tamen & Bergendorf on its 1995-1996 rehabilitation. He assembled a massive weath of information which was originally distributed in 2001, in a very limited edition, run off on the office laser printer. This reprint is on nice, heavy, glossy stock, with a sewn hardcover binding. Rather than a book, imagine The History of the Veterans Memorial Bridge as an impressive, well documented archival collection. All of the photographs that you might find in an archive, all the historical documents, everything. Further, it's explained by someone who clearly knows the subject. Byers begins by documenting the need for a high level bridge, describing the frequent traffic jams and malfuntions suffered by the old Superior viaduct. He goes on to describe the purchase of the real estate, the bidding of the contracts, and more. In addition to photographs, the illustrations include many editorial cartoons depicting the political battles surrounding the construction of the bridge. When we get to the actual construction of the bridge, it becomes quite obvious that Byer is an engineer. The discussion becomes quite technical in nature, though still readable to the layperson, for the most part. The photographs of the actual construction are impressive. They show, in exhaustive detail, the work on the bridge. Each and every step in the building process is docuemented in detail. Byer continues, providing photographs of the use of the bridge by automobiles, streetcars, and pedestrians. Streetcars ran on a second level, underneath the bridge. The construction and design of this and the approaches are documented fully. Readers will also be interested to see in the photographs various buildings in the flats and at the ends of the bridge that are no longer present. In the 1950s, streetcars lines under the bridge were shut down. A feasability study was conducted to determine whether cars could run on the lower level. It was determined that they could not, and the access wells on each end of the bridge were filled in. The documentation includes the two major rehabilitations of the bridge, in 1967-1970 and 1995-1997. That the damage was allowed to get as far as it did is concerning at times. It is impressive to see how it all went back together. Byer also provides brief biographies of some of the engineers on the building of the bridge and some of the involved a companies. A massive fold-out technical drawing of the bridge is also included. Appendices contain bridge contracts, bid quantities and prices for the original construction, both rehabilitations, and the 2004 promenade. Additional appendices contain correspondence relating to the bridge, sample design calculations, and some basic computations of the geometry and stresses on the bridge. Beyer finishes the book with an exhaustive bibliography. This is not simply a book for the bridge nut. It's one of the better photographic collections that I've come across dealing with the history of the area. It's priced right, too, at $40, shipped. While that isn't exactly cheap, for a 600 page book of photographs, it's a good deal. You can fill out the order form and mail it in or save $10 by picking it up in person at the Cleveland State University Michael Schwartz Library. Well, I toddled over to CSU yesterday and bought this book with my credit card -- just walked up to the checkout desk at the main entrance and somebody there knew what I was talking about, although the other person didn't. The library was kind of empty, they appear to be on break still. I like this book a lot. Profusely illustrated, as you say. A lot of construction photos but also a lot of photos of the bridge in use over the whole period, including lots of coverage of the area around and under the bridge itself. Do you have any good link for bridge engineering terms? I'm kind of drawing a blank on "lower truss chords" and "inclined eyebar backstays". Not that that should stop anyone from getting the book, the photos are still great. B.P. Beckley - I wish I had a good answer for you. I've been unable to find anything suitable online. This book, Bridge Engineering, looks like it would provide the answers you see, though it sounds likely that it, too, would be excessively technical. There is a reference book that contains diagrams of everyday things, like guitars and ships, that tells you the names of their parts. I think it's meant for writers. I'm trying to remember what this book is called (it's not The Way Things Work, which doesn't appear to have anything about bridges, just from doing a search on Amazon). Do you know what I'm talking about, Christopher? I used this book all the time when I worked in reference. Also, How Stuff Works might be helpful. Christine, I'm not familiar with that book. It does sound like it would be very useful, for this and any number of other things.